reaking Dawn, Part 2 begins a few days after Breaking Dawn left off. In order to save Bella’s life after giving birth, Edward changed her into a vampire. Bella awakens to new world. With her now heightened senses she can see the smallest of specks. Hear the tiniest of noises. She can runs with the wind and leap up the side of mountains. Her priority is to meet her new daughter, the STUPIDLY named Reneesme, but first she must quench her new found thirst for blood. She shocks Edward by showing restraint by not attacking a human. A feat that is almost unheard of when a “newborn” vampire is concerned. She also seems to have picked the power to shield herself and others from pain. But first, she must meet her baby girl. What she doesn’t know that Jacob has imprinted on the baby. Imprinting is a phenomenon by which a werewolf chooses a life mate. As Jacob explains, he has no control over who he chooses and by fate, he chose the baby. Of course this is not an inappropriate relationship while she is a child, he will fiercely protect her and never leave her side until she is grown at which time they will be together as man and woman - or more accurately; Half Vampire/Half Human and Werewolf. As protective as they are of Reneesme, word of her existence has reached the Volturi. Turning a child is a crime. Children have no control over their urges and can take out a whole village. So it is a crime punishable by death to create one. Edward and Carlisle realize that no matter what they tell Aro (Michael Sheen), the leader of the Volturi, he will believe what he wants to believe and its only a matter of time before he arrives to kill them all. They reach out to their family and assemble 18 vampires of varying ages and backgrounds, some with powers most without. The plan is not to build an army to fight the Volturi, but rather allow them to get to know Reneesme and in turn vouch as witnesses that she is not an immortal child, but rather a child born naturally out of love. Wit Jacob’s pack at their side, they will attempt to convince Aro, but he is so unpredictable, will their plan work or will they have to fight to the death? I don’t need to tell fans to see this one. They are diehard fans that’s for sure. There are a few twists and shockers that made it worth the price of admission. (funny/punny, since I got in for free). Make sure you atch the main ending credits, I love the homage they paid to the characters and actors who played them. 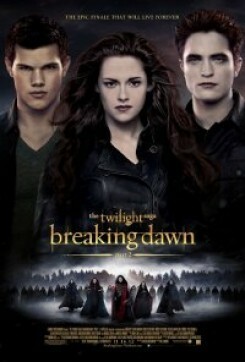 Breaking Dawn part Two will most likely break a few hearts but it is a good close to the story.